I’ll also be documenting my time with DxE in Berkeley, and LA Pig Save in addition to some other activist activites I am not yet at liberty to share about publicly. I approached the Vegan Society of P.E.A.C.E. to put up a vegan info table at my show in Houston. They kindly agreed and then invited me to speak at their monthly Second Saturdays – thus inspiring me to put together a talk about how I combine Arts and Activism. I am really excited about the potential to inspire others to infuse their advocacy with creativity. I’ll be giving these talks for Northewest VEG in Portland and at the Berkeley Animal Rights Center, CA. Check my tour schedule for these dates as they are updated and please let me know if you’d like me to speak in your city! This one explains itself, I think! 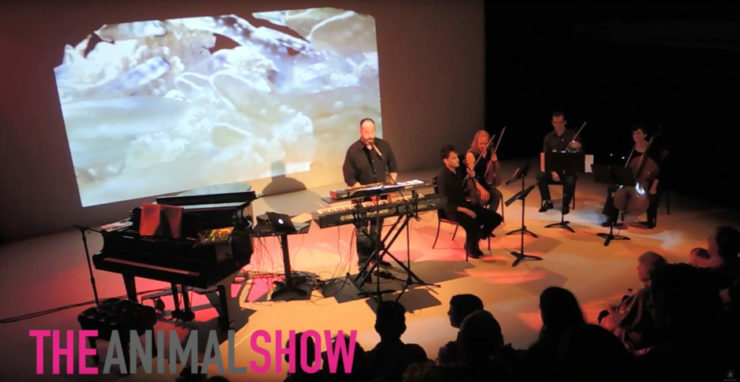 I’ll be performing my multi-media solo show, The Animal Show, in Houston, Los Angeles, Berkeley, and Portland. All the dates are on my calendar here. I am so grateful to A Well Fed World for funding this project. Those funds enabled me to upgrade my video equipment and will cover my car rental for the trip! There are many more expenses for this trip, including venue rentals, box office and tech staff, musicians, gas, additional housing… the list goes on. The average cost of putting up my show is about $1200, depending on the cost of the venue. If you’d like to help support this project, you can subscribe to my Patreon page for as little as $1 a month, or make a one time tax-deductable donation here. If you’d like to sponsor a show in one of these cities, let me know and we can discuss making that happen! Beyond that, if you live in one of the cities I am visiting, or have friends there please share share share and share this information with them! Unfortunately, this tour is so expensive, I won’t have the funds to hire a publicist, so I can really use your help in this way too! Thanks for reading, and please do spread the word!